This lovely private villa to rent on Folegandros is situated in the area of Anomera about 3 kms from the village of Chora, and 2 kms from the nearest sandy beach. It sits in a wonderfully tranquil location, within its own grounds of 400m2, surrounded by hills, and uninterrupted views over the island to the sea. 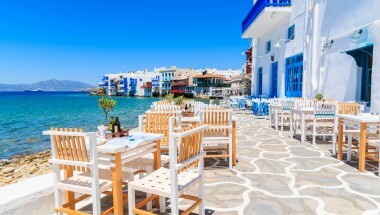 Although known for its peaceful and relaxing atmosphere, still untouched by mass tourism, the island offers a number of activities available, including surfing, waterskiing, sailing, paragliding, diving, tennis and horse riding. There are also facilities for car rental, as well as motorbike, bicycle and boat rental. The house is constructed on two levels, using design, colours and materials totally in keeping with the scenery, and in keeping with the simple natural beauty of Folegandros. There is a pergola covered terrace for relaxing outdoors, including an outdoor dining table and barbecue. There is also a small pool (5 x 2m) with Jacuzzi. The rooms are very tastefully decorated and furnished in soft, neutral colours. Equipment includes satellite TV, DVD, CD player, hairdryer, ceiling fans, safe, heating and washing machine. The closest internet café is in Chora. 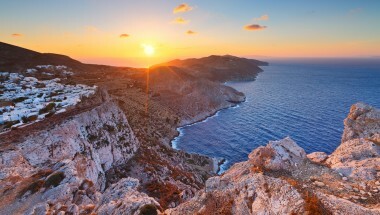 The easiest way to reach Folegandros, is by direct charter flight to Santorini (or scheduled service via Athens), then a fast ferry service, which takes about 45 minutes. There are daily ferry services from other Cycladic islands. From Piraeus (Athens port), there is a high speed ferry or hydrofoil service which takes approximately 4 hours. Double bedroom, which can be made up as twin beds, with ceiling fan, and bathroom (shower and WC). Laundry room with washing machine. Bathroom with shower and WC. Living room with dining area. Kitchen, well equipped, including oven, fridge, freezer, dishwasher, washing machine, toaster, coffee machine and microwave. Master bedroom with ceiling fan and en-suite bathroom with shower. 2 double bedrooms with ceiling fans, terrace and sea views. Bathroom with shower and WC. Maid service included 2 days a week. Extra services required, including additional maid service, and a cook, can be arranged but will incur a booking fee from the owner of €50, payable in advance. A private villa in a quiet and peaceful location in the area of Anomera about 3 kms from the village of Chora, and 2 kms from the nearest sandy beach. 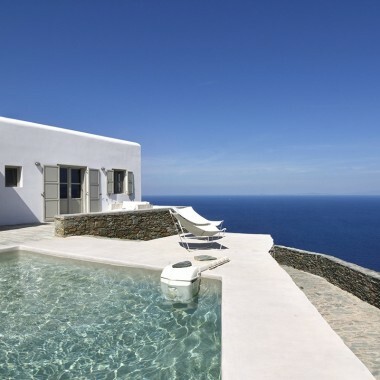 The property benefits from uninterrupted views over the island to the sea from its terraces and small pool. The island offers a number of activities including surfing, waterskiing, sailing, tennis and horse riding.